Perhaps I should just have one huge post on user-generated content that gets updated as merited because, to continue with the theme of UGC from the last update, this example shows what happens when a newspaper assumes everyone has the same knowledge and standards. 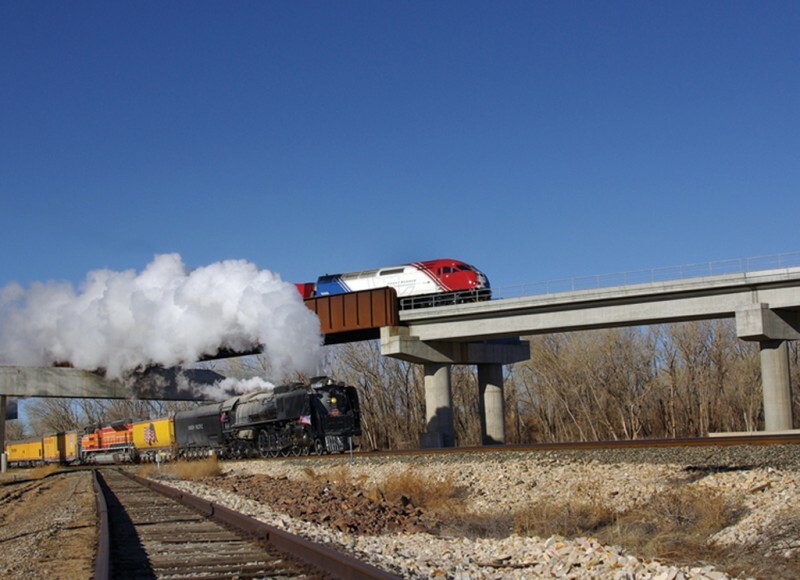 The photograph on the right appeared in the Standard-Examiner in Ogden, Utah, recently – two trains, one new, one from bygone days of steam, captured barrelling along under a crisp blue sky. Taken by a ‘trusted contributor’ who submitted it to the newspaper, it was published on the front page of November 27 edition. Then, on December 17, the Standard-Examiner’s Behind The Headlines column carried what amounts to a long explanation for misleading readers. The photo was taken by a “long-time train enthusiast”, whose work had been published by the paper before, and who deliberately set out to capture two shots that would when manipulated, show the old and the new in harmony. He shot separate photos of both trains and didn’t think twice about overlaying the photos to create the composite image. He said he had read a column of mine where I explained that photojournalists try to tell a story with their images. To him, combining the photos was just a way of telling the story. The column apologises for the deception (although one could question the depth of the apology after reading the whole column); it doesn’t accept responsibility for checking the provenance of the image, however. The big mistake James [the photographer] made was not telling us the image was a composite. If we had known, we might still have run it… and clearly identified it as such…. James is sorry he didn’t tell us. There should be a mea culpa from the newspaper at this point rather than a ‘James is sorry’ (the photographer misled by omission, not through an intention to deceive the newspaper). The column says the lesson for us all is that “sincere motives can still lead to bad journalism”. Actually, not checking sources leads to bad journalism, and readers know it – read the comments accompanying the column (90 of them last time I looked). …we need do a better job of educating the public as to the role and ethics of journalism if we want them to be regular contributors. Possibly a simple (humble?) “We are sorry and we have tightened our procedures so this cannot happen again” rather than an explaination as to why the newspaper was not to blame would have played better with the audience. Behind the Headlines state one of the principles of journalism is: Never Deceive Your Audience. Perhaps it should remember another: Check Your Sources. Shifting to Google Apps from Microsoft – not a trend… yet. It boils down to the fundamental principle of journalism: verifying your source. Just because something is 'UGC' doesn't reduce the burden on the news organisation to check it thoroughly. Journalism's biggest challenge is to learn to apologise more readily. The Guardian's apology for printing incorrect information relating to phone-hacking was grudging, at best, and very slow – wrapping it up at first as an 'editor's note' and then trying to saying 'but it doesn't change the overall story'. That's not the point – if something is found to be wrong, even if was believed to be correct at the time – then we should be upfront and apologise. The BBC DG's response to the 'fakery' in Frozen Planet – failing to flag up that footage of a polar bear being born was shot in a zoo, not the Arctic – was to suggest that the public wouldn't mind. If that was/is indeed the case, then there should have been no problem flagging that up in advance? Journalism stands or falls depending on the level of trust the audience has in it. To that end, the most important change we need to make is to be more ready to accept when we're wrong – and ensure our audience know that we're prepared to say so. Anyway, I totally agree – failure to come clean on mistakes leads to a massive trust issue for readers. I guess most people, if asked to seriously think how the BBC got polar bear den footage, would have started to doubt such a feat was possible. The fact remained, however, that amazing footage was captured – so why not be transparent about where it comes from? You can usually piece it together from the list of 'With Thanks To…' in the credits but as it was the Beeb ended up with an out-of-proportion problem.